The holidays are past us, for better or for worse. If you’re a business owner, chances are you’ve just been through a whirlwind of sales, returns, problems, and profits. It can be tempting to put your feet up, happy you put out the fires and made an extra bit of dough. However, this is precisely when you need to be on top of your game. Understanding what the post-holiday season means for your business and how you can best take advantage of this time could mean even more sales for your growing business. Why Is the Post-Holiday Season So Important? Quick question: Which three days are the biggest for shopping-related searches on Google? If you said Black Friday, Thanksgiving, and the day after Christmas, you’re correct. The last of these, December 26th (known in many non-US countries as “Boxing Day”), ranks higher than Cyber Monday. Post-holiday shopping is an often-overlooked period of sales, yet there are droves of shoppers who eagerly look forward to this time every year. The stats are impressive. 75% of shoppers jump on end-of-year sales, and 31% wait for clearance sales because they think they’re going to find a steal. American shoppers are savvy—they’re always looking for a deal. In addition, so many gift cards are given and used during the holiday season (along with Christmas and end-of-year bonuses) that people have a surplus of spending money. This means your restaurant, your shop, or your service might see a boost in sales if you play your cards right. One of the best ways to increase your chances is to promote your positive ratings and reviews. Did you know that Yelp receives, on average, 142 million unique viewers each month? That’s nearly half the population of the United States. Ratings and reviews sites are not only highly frequented, they’re also highly trusted. Because of that, you need to highlight your good reviews as much as possible. Here are two excellent methods of doing this: responding to customers via rating-and-review sites and promoting their testimonials on your site. Now it’s time to take those ratings and reviews and put them up on your website. Post that five-star ZocDoc review where a patient really addresses something strong about your practice (“Dr. Jones really listened to my concerns and eased my mind.”) or that raving Yelp review with specific praise (“Seriously, best ceviche this side of Peru.”). 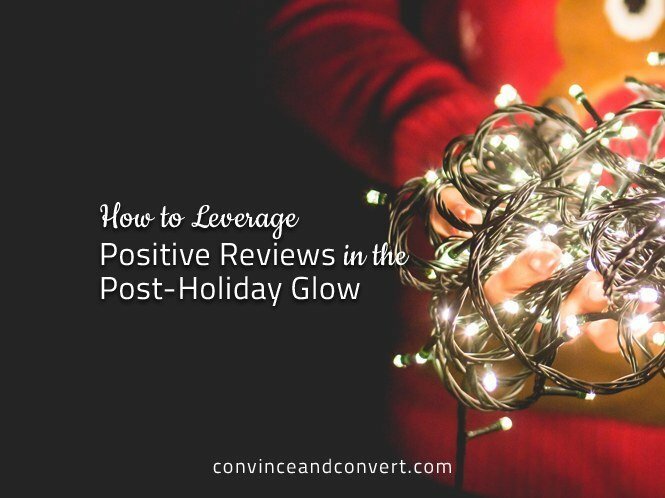 Posting positive reviews builds credibility through an outsider opinion while highlighting a selling point of your business you may not have considered. Now that you’ve highlighted some of the best reviews on your website, it’s time to take inventory. Take a serious look at the reviews, both positive and negative. Feedback like this is invaluable—any trends should be examined. If you are seeing constant complaints about a certain aspect of your business, it’s time to re-evaluate how you handle that aspect of your trade. If you see some positive trends, make sure to keep these alive in the new year—this is what’s setting you apart from the competition. And be sure to use this as fuel going forward. After all, it’s a brand new year.